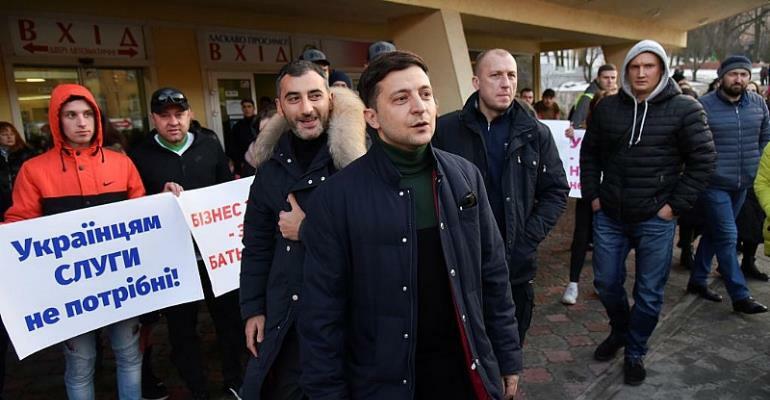 Polling stations have opened for the first round of Ukraine's presidential election with newcomer comedian Volodymyr Zelensky out in front, according to the latest polls. The election has been overshadowed by a flare-up of violence in the east, where a Ukrainian soldier was killed on Saturday. Volodymyr Zelensky, who has a young support base, is currently polling above 25 percent, offering a serious challenge to pro-Western leader Petro Poroshenko who is seeking re-election on Sunday. Zelensky acknowledges that he has "no experience" but nonetheless insists he has the strength to lead Ukraine. Critics point to the vagueness of his manifesto, the key pledges of which were chosen following a public vote on social media. Poroshenko came to power in 2014 after a revolution forced Kremlin-backed predecessor Viktor Yanukovych from office. At the time, he promised to tackle graft, align Ukraine with the West and shut down the fighting in the east. But five years on, corruption is widespread and the simmering separatist conflict has cost 13,000 lives. One recent survey put Poroshenko at around 17 percent, neck and neck with another contender, the former prime minister Yuliya Tymoshenko who has also expressed largely pro-European views during the campaign. She has promised to cut consumer gas prices in half and boost pensions as she appeals to an older base during her third bid for the presidency. None of the openly pro-Russia candidates are seen as serious contenders. Kiev's armed forces said in a statement on Saturday that the situation had "escalated significantly" in the previous 24 hours, accusing rebels of using heavy weaponry banned by peace agreements. The army added that four of its soldiers were wounded in large-calibre mortar and artillery attacks. The rebel authorities did not announce any casualties on their side. Kiev and its Western backers accuse Russia of funnelling troops and arms across the border to fan the flames of the conflict. Moscow has denied the claims despite overwhelming evidence to the contrary.